B2C acts only in the capacity of agent for the wedding packages, hotels, airlines, transporters, railways & contractors providing other services & all exchange orders, receipts, contracts & tickets issued by us are issued subject to terms & conditions under which these services are provided by them. 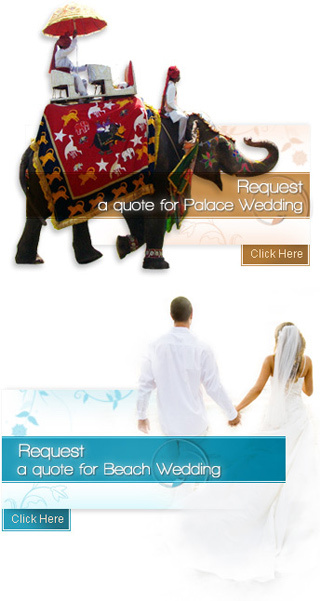 All Wedding packages are sample packages, intended to give you a general idea of the likely wedding schedule. There might be a change in the fabric/ flower colour & type , wedding set structures , pillars designs , Entertainment setups etc due to numerous factors such as weather, road conditions, the physical ability of the participants , availability of the materials etc. may dictate package changes either before the wedding or while on the trail. We reserve the right to change any schedule in the interest of the package comfort & general well being. Our rates are based on the prevailing rates as negotiated by us with the Weddings vendors, Hotels etc. As the vendors, Hotels retain the right to modify the rates without notice. In case of such changes the rates quoted before the modification, can be changed by us according to the modifications by vendor or hotels. We shall not be responsible for any loss, injury or damage to person, property, or otherwise in connection with any wedding package accommodation, transportation or other services, resulting - directly or indirectly - from any act of nature, dangers, fire, accident, breakdown in machinery or equipment, breakdown of transport, wars, civil disturbances, strikes, riots, thefts, pilferages, epidemics, medical or custom department regulations, Government / Court laws , or any other causes beyond our control. As per the wedding photography and Videography is concerned it might take one month or more than it to get it delivered as the vendors have a certain policy to follow. We get the edited and the original copy of the DVDs delivered however we keep a soft copy of the edited ones with us for next Three Months. . Incase of any loss or damage in between the period of delivery B2C is not responsible. All the couriers and deliveries are through FedEx Couriers. The beautician package mentioned in the SLA will be the final one however any extra services done at the last moment for the guest or any other changes made at the time of the event will be charged extra then and there. We have absolutely no control over legal system in India however for the foreigners and the NRIs Now, registering the wedding legally in India strictly needs a prior stay of 60 days in India and 30 days in Goa. Some planners for the sake of closing the deal commits that they can shrink it in to 7 days which is not possible as the judge goes through the immigration stamp on the passport. We tell all our customers to get them legally registered at their Home country & then do their wedding & celebration in India or they can also do their legal registration after going back as per their convenience. At no given circumstances B2C will be held responsible for such delay or rejection of the case.